It’s slightly uncomfortable to make reference to a political party in this blogpost, but the developer in question, Jerry Beades was until recently on Fianna Fail’s Ard Comhairle (National Executive) and is a “close friend” of Bertie Ahern, which makes the party-affiliation noteworthy. Jerry was on the receiving end of a Mr Justice Peter Kelly Kelly judgment in July 2012 which has just now been published online. The case involved Bank of Scotland pursuing Jerry for nearly €10m lent for property development, and during the course of the hearing, Judge Kelly asked what you might have thought was a straightforward question – if Jerry had received the monies at issue from Bank of Scotland – and the response was “I refuse to answer that question”. Jerry – pictured here – who seems to have two home addresses these days, one at 30, Richmond Avenue, Fairview, Dublin 3 and the other in Northern Ireland at Stoneyford Road, Lisburn, County Antrim, failed in his bid to stop Bank of Scotland securing a summary judgment from Judge Kelly in respect of €9.7m. The judgment is also noteworthy for allegations by Jerry of bias on the part of Judge Kelly evidenced, said Jerry, by “comments and actions” at two previous hearings – one of which Jerry didn’t attend but he was told about the “comments and actions” by “people who were”! Judge Kelly was having none of it and pointed out that no evidence of bias was produced by Jerry, and that in any event Jerry had been granted discretionary extensions on time to file affidavits, hardly the acts of a biased judge. Jerry also alleged criminal behaviour on the part of a practising solicitor at A&L Goodbody, and against Bank of Scotland/Certus employees. But when presented with evidence which contradicted his allegations, the judgment states “one might have thought that in the light of this evidence, Mr. Beades would withdraw his allegations against Ms. Wrightson and Mr. Sheehy. On the contrary, he persisted in them. Indeed, he went further. Without a shred of evidence, he alleged that Ms. Wrightson’s affidavit had not been sworn in London at all. He alleged that Mr. Sheehy was not entitled to take the affidavit because he was not a solicitor registered with the English Law Society. He attempted to implicate Mr. Sheehy’s employers, A& L Goodbody, in wrongdoing.” Again, the no-nonsense Judge Kelly was having none of it. Summary judgment of €9.7m was awarded against Jerry. Psst! 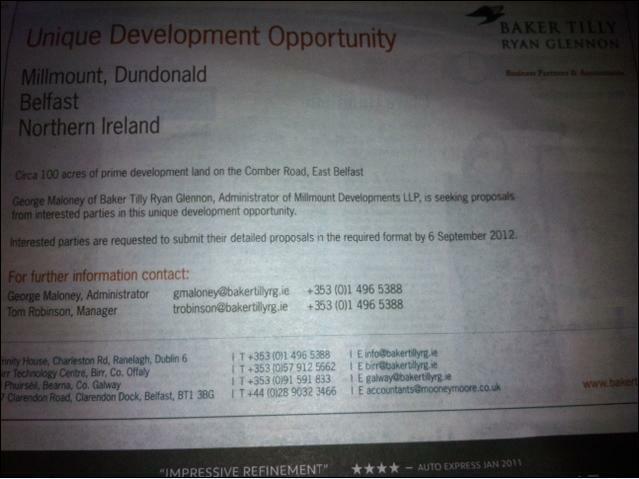 One of NAMA’s most significant properties in Northern Ireland comes onto the market, but don’t expect NAMA to tell you. When the Unlock NAMA people occupied the office building on Dublin’s Great Strand Street in January this year, there was amazement on here that they were able to even find the place given that it was NAMA had given it an incorrect address on its enforcement list, and described it as a warehouse. Seven months on and NAMA’s enforcement listing is still a national disgrace. 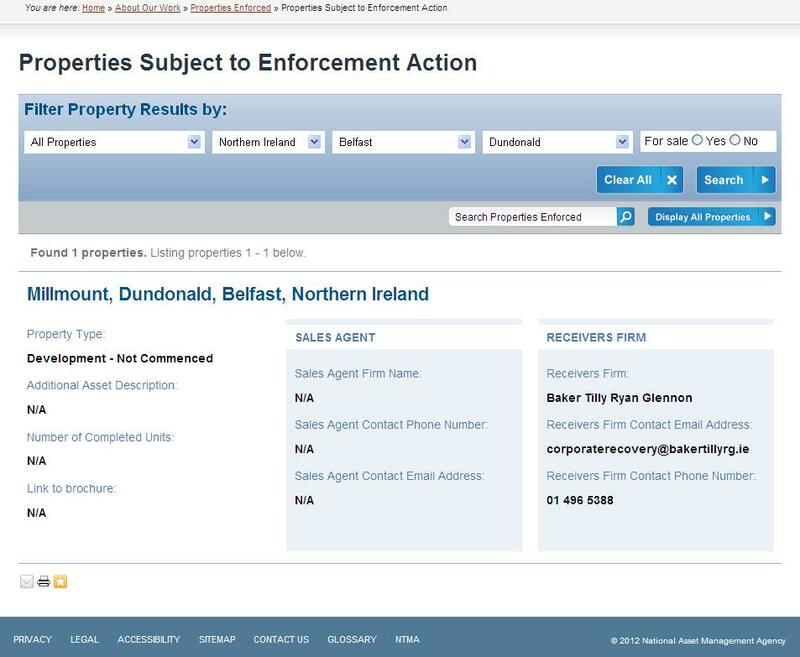 One of NAMA’s most prominent foreclosed properties in Northern Ireland, a 96-acre development site on the outskirts of Belfast has come onto the market, but I would challenge you to (a) find it on NAMA’s website and (b) establish from NAMA’s website that it is for sale. 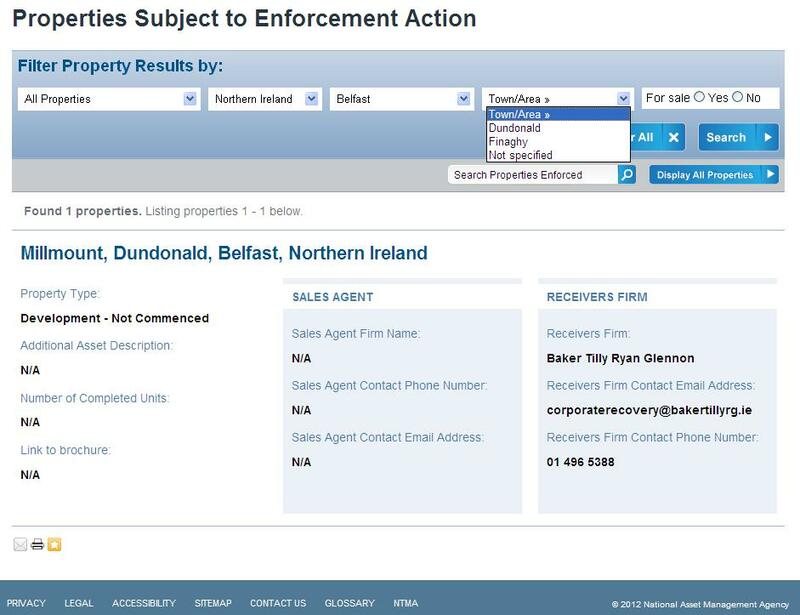 The property is in Dundonald in County Down, and if you were to go to NAMA’s enforcement listing facility, you might face a challenge finding it. NAMA’s enforcement list has only three countries – Ireland, Northern Ireland and Great Britain. But how many counties are there in Northern Ireland? Six, you might have said, but according to NAMA there are 16! Nonetheless, enter “Down” as the county and you will then be able to select “Dundonald” from the “Town/Area” filter. But alas, you won’t find one of NAMA’s most significant properties in Northern Ireland that way. What you need do is enter one of NAMA’s 16 counties, “Belfast” as the county. 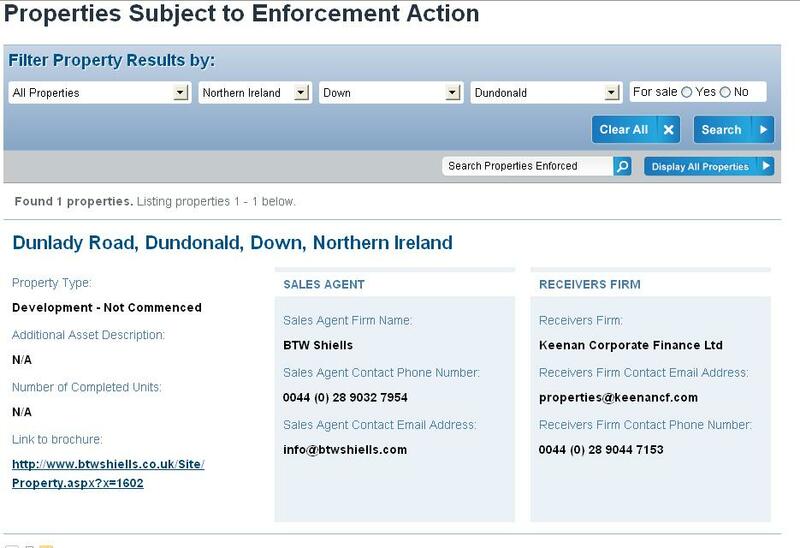 And under “Belfast” there is an option for “Dundonald” and that’s how you will find the property. And yet when you do find the property, it is listed as “Not for Sale”! Which is contradicted by this newspaper advertisement from last week, where expressions are sought by 6th September, 2012! The site in question is partly developed, and has been owned in the past by the Taggart brothers and a company in which Lagan Homes was a partner. The site was to accommodate 100 homes in its first phase with a plan for an additional 500 later on. 25 people had paid deposits for houses but these were returned. Brendan McDonagh is the chief executive officer of NAMA and he is ultimately responsible for this enforcement listing which is the most sought after information held at NAMA that is publicly available. It is bad enough that NAMA has been selling property off-market, like the two separate land-banks in Cork, it is bad enough that NAMA is selling property off-market to its own employees, it is bad enough that NAMA no longer provides a full listing of its foreclosed property in one document and it seems that NAMA hasn’t updated its listing since June, but to see – by accident – one of the most significant properties in Northern Ireland come onto the market and to then see the errors on NAMA’s foreclosure listing facility is a disgrace, and one which falls firmly on Brendan McDonagh’s shoulders. UPDATE: 23rd August, 2012. Although NAMA is not dismissing the prospect of purchase offers being made for the site in response to the above advertisement, it is saying that the Baker Tilly advertisement is seeking development proposals, which is why the site is not listed for sale on the NAMA website at present. The KBC legal action against Treasury Holdings which was adjourned at the start of August, is set to continue this morning [CORRECTION: The Court Service has not updated its daily list since 8th August, 2012 and the case is not in fact due to continue until Monday 27th August]. KBC is seeking a winding up order for Treasury, on foot of a claim for outstanding loans of €30m. Treasury Holdings which was founded by the colourful Johnny Ronan and understated Richard Barrett is mired in litigation with NAMA – Treasury lost its judicial review case against the Agency last month, but was set to appeal. Separately NAMA is suing Treasury and its founders over debts. Treasury is also suing NAMA over the treatment of debt associated with the Battersea Power Station site in central London – it’s a veritable “Litigationfest”, but if Treasury is wound down today, then that may undermine the future of any litigation. UPDATE: 21st August, 2012. The case is not in fact due to continue until Monday 27th August, 2012. The “Daily List” at the Courts Service has not in fact been updated since 8th August 2012.